As masters of camouflage, their ability to blend and seemingly melt in with their surroundings both in color, patterns, shape and texture, makes them incredibly hard to spot unless you have the patience to hold very still for a time scanning your surroundings for a coral head or a rock that suddenly seems to begin slightly moving. Finding their "houses" can be a bit more difficult, which is usually a little hole that they will cover the entrance of with bits of available rubble. A tattle-tell sign can be a mound of freshly broken and empty shells from a recent feast left outside their "door". I have found that their curiosity can easily get the better of them. One afternoon I had just finished leading an underwater tour and after making sure everyone was back on board I decided to check the anchor and hang out under the boat for a little while, just kind of floating in place a few feet off the bottom enjoying the weightlessness and scanning my surroundings. About 30 or 40 feet away I noticed the top of a large coral head slowly appear to "grow" about a foot taller. Knowing what it had to be, I decided I'd spend the rest of my air checking out this octopus. Naturally as I approached, she "melted" back into the crevice in the top of the coral head so I crouched down at the base of it and waited a couple of minutes. When I raised my head to have a look, there was the top of the octopus' head looking at me with her two strange eyes and then she sank back down into the safety of her space, so I did the same. This went on for some time; each time revealing more and more of herself. I just copied her actions, sinking down no more or less than she did until finally we were both completely visible to each other only a couple of feet apart looking each other over. A short time later it was time for me to head back to the boat and as I looked over my shoulder she was still raised up in a big capital "A" shape watching me go. Mind you, my hide-and-seek act was neither quiet nor invisible. I do have to make my "Darth Vadar" breathing sounds, blowing a myriad of expanding bubbles to the surface every so often. 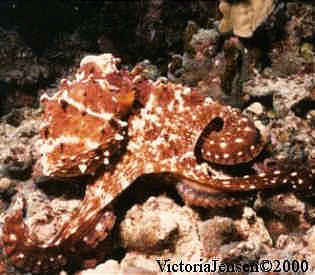 I learned later that octopi are deaf, but their vision is extremely keen. As visual as I was, I would have to say they are indeed, remarkably curious creatures. The more one tries to pull, the more the octopus feels its security is being threatened and the tighter their grip becomes. The best course of action is to just hold still or sidle up to a rock or coral head which they much prefer to the instability of humans. 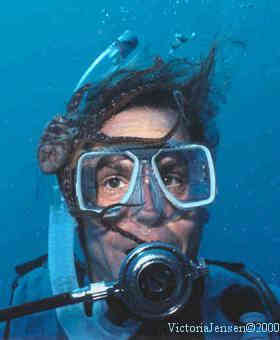 I was in a situation once while photographing a rather large one, a 3 footer, at a depth of about 70 feet. I had become quite entangled with him. He had tentacles wrapped around me, my camera & strobe and my regulator. Since I had a back up air source I wasn't too concerned about the regulator, but I was foolishly trying to get my framer back from him after he pulled it off the camera. Then I noticed one of my fins had come off as it floated by my head on its way to the surface. Deciding that I would be much more hampered without the fin than the piece of camera gear, I began a slow ascent to retrieve it. As soon as I stopped focusing on him and my framer and began to move upwards, he let go and took off. Actually their skin is pretty tough. If we were to crawl around bare skinned in the coral and rocks the way they and the ever so soft eels do, we'd be pretty cut up. Though they have a "beak" which is located under the head where the tentacles stem out from, capable of crushing shells to get at the meat inside, I have never been bit nor been on a dive where anyone else has. I have been told that "night octopus" are much more prone to biting and though I have handled them, I am a little bit leary of them. They are really cute little guys, quite a lot smaller with little white spots. The largest one I've seen in Hawaiian waters was a little under a foot long. When they choose to move through open water from one area to another they jet propel themselves by in taking water and forcibly blowing it through a funnel as they contract their muscles. Their movement in this manner is limited to short, but quick bursts in a singular, head first direction; though with the addition of their famous "ink" cloud, which serves to hide their movements and temporarily ruin the sense of smell of potential predators such as eels, they can usually make good their escape when it becomes necessary. 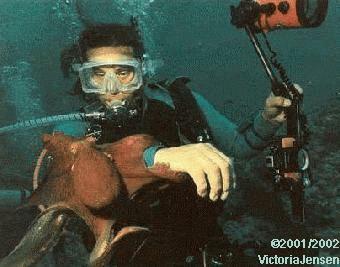 I once had the privilege of observing the mating ritual of the octopus. It looked more like passionate hand holding as they intertwined a tentacle with one another. I wasn't really aware of what was going on until my dive buddy explained it to me using a few well chosen hand signals. After doing some reading on the subject I learned that the male has a specialized tentacle which sends sperm to the mantle cavity of the female. One article claimed the female lays strings of 45,000 eggs and another claimed 150,000. Although the information I read didn't specify, I presume the egg count can differ from species to species. Either way it's quite a lot, though only a very small percentage actually survive to adulthood. I saw part of an excellent documentary on the TLC channel that really took the time to show and explain the whole process. The strings of eggs were hanging from the ceiling of her lair as she cleaned and aerated them by blowing water through her siphon. She spends the rest of her time guarding them, never feeding herself, leaving only to fight off a potential predator that gets too near. The eggs can take anywhere from 1 to 6 months to hatch. There was some really great close up footage of the tiny little octopi emerging from their pearly, translucent, teardrop shaped eggs! The down side for the mother is that once the eggs have hatched she is weak and vulnerable to predators when she finally emerges in search of a meal. I had read one article that claimed the female dies after the eggs hatch, but I have since heard that some octopus mothers in captivity do just fine afterwards. I can only hope that some mothers in the wild manage to survive as well. I became aquainted with a woman, through my guest book, who works in a zoo in Missouri. I asked her about the life expectancy of the mother octopus in captivity. She said, "No, sorry, we have not had any luck keeping one alive after the hatching of the eggs and it seems that some of the females die after laying eggs. There was one Aquarium that has managed to keep their octopus alive through several egg laying cycles. How I'm not really sure, but we had hoped to do the same with ours. Another Aquarium was able to save one hatch an octopus from their female, but that was like one out of 4,000 and with a 24 hour keeper watch." The really great thing about the documentary I mentioned before was the way it spent the time necessary to follow the life of one female octopus and all that was involved with the laying and hatching of her eggs. I missed the beginning of it and have been watching for it to be shown again ever since. It is well worth seeing. I believe it was part of their "Secret Life" series. All of the photos on this page are of the "Common Octopus" (although, I find them very beautiful, endearing and deserving of a classier name), and were taken by me in Hawaii. If you would like prints or would like to use any of them please click on my "Photo Copyright" link. 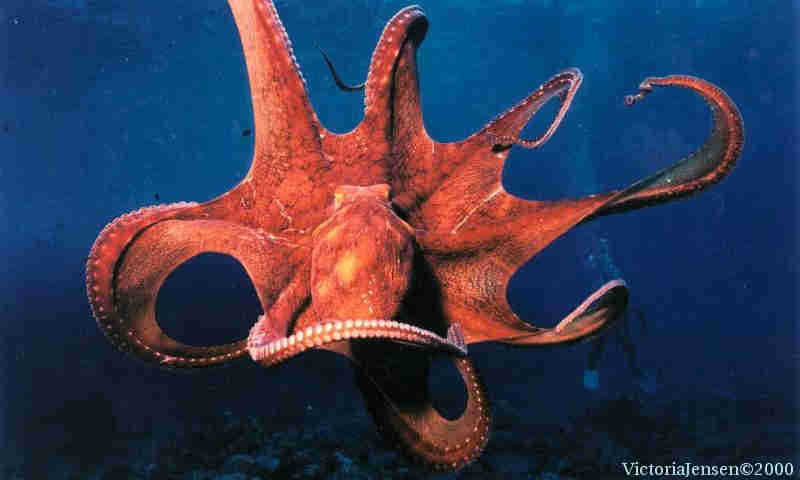 Reading about the octopus has been a bit of a mystifying experience. I have found a lot of contrasting information. 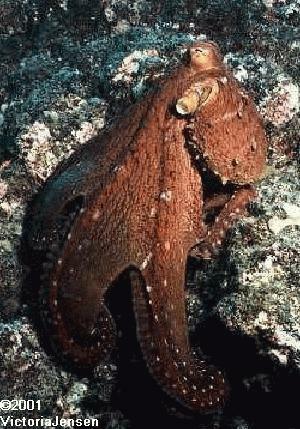 For instance, one source said that the common octopus usually only comes out at night, yet during daytime in the summer months in Hawaiian waters I can almost always spot at least one or two per dive, rising out of a hidden crevice, as if to see what's going on, or zipping from one coral head to another. I don't have what they call "The Eye" for spotting them, but there are so many around in the summer, even I can find them. Maybe it's warm water locations that entice them out in the daytime; but I think the bottom line is that there is still much to be learned.